Kirsten Dunst has apparently confirmed the much-mocked rumor that the two villains of Spider-man 3 are, indeed, Venom (Topher Grace) and Sandman (Thomas Haden Church). And if the leading actress in the film is wrong about its characters, well… this project is in deep trouble. I’ve just returned from a relaxing weekend of writing, reading, and sipping various beverages in glorious Vancouver, B.C., where I was blessed by the generosity of a certain Hollywood producer who invited me, Anne, and our screenwriting friend Danny to visit him on the set of a little picture you could call X-3. And of course, out of respect to the hardworking filmmakers, my lips are sealed as to things we learned along the way. But having sat just behind Bret Ratner as he organized some stunt-oriented shots and watched them on his monitors, having casually made a casting recommendation that he took very seriously, and having watched as Magneto and Wolverine engaged in a thrilling confrontation, I can say with some confidence that there will be good reasons to line up for this third sequel. The sun was going down, so they were in a hurry to finish the scene, but the professionalism of everyone on the set was impressive, and Ratner welcomed us warmly and invited us right up to the front lines, where we listened in on his conversations with his assistant director, cinematographer Dante Spinotti, and Ian McKellan. I can’t wait to see if my casting recommendation comes to fruition. Ratner seemed very excited about the idea, and sent folks running to investigate the possibility. We’ll see. The next day, we encountered more celebrities up close and personal–we shared a breakfast with Peter and Deanna Chattaway, and I suppose it’s worth noting that they weren’t the only Chattaways at the table. So, while there were seats for only five of us, it was breakfast for seven. You do the math. We hung out at Calhoun’s, a wonderful coffee shop for reading and writing, and also at The Bread Garden (which has undergone a dreadful remodel, losing its cozy personality and its extraordinary fresh scones for a forbiddingly shiny decor and conventional, uninteresting pastries.) One evening, Danny and I sampled local microbrews at a forgettable but sufficient pub called Shenanigans while I penned another chapter of the Auralia’s Colors sequel, and the next afternoon the three of us sampled various ales at the Granville Island Brewery. Shopping in some Granville Island toy shops, I should note that I discovered the most unnecessary Lord of the Rings action figure ever to hit the market… BILBO TRANSFIXED. Can you believe that? He appears onscreen like this for less than half a second in The Fellowship of the Ring, and he earns his own action figure. Isn’t that similar to Judi Dench winning an Oscar for an exceedingly short “supporting role” in Shakespeare in Love? Now, I’m back home, and I really should be doing my assignments: this week’s Film Forum, a review of A History of Violence for CT, and Looking Closer’s review of Serenity. So off I go. Stay tuned. Oh, by the way, when I arrived at home, I found something wonderful in the mail… an advance copy of David C. Downing’s Into the Wardrobe: C.S. Lewis and the Narnia Chronicles. 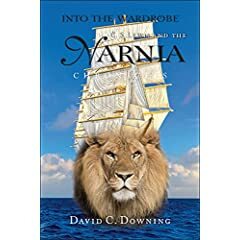 Downing has done his homework, crafting a volume that will give newcomers a revealing glimpse into Narnia’s creation, and longtime fans will find their appreciation for the Chronicles deepening as they read. You’ll see my rave review on the back of the book. I encourage you to pick up a copy. Jossey-Bass has given it a beautiful cover, and it’ll make the perfect stocking-stuffer for the fantasy fan in your family, just in time for the release of the season’s most anticipated feature film. Whether the film soars or sinks, Downing’s narrative about Lewis’s writing process is worth perusing. Wow, Topher Grace as Venom. That has to be the worst casting ever. He’s a huge guy with muscles, Grace is a skinny runt. Venom is a huge guy (alien) with muscles, but Eddie Brock is just a fellow reporter at the Daily Bugle. I kind of like it. Sets up Eddie as the anti-Peter. Actually, Brock was a body builder and weight lifter, it gave him a slight strength advantage over spider man. On his profile in Marvel Univers it was listed he could lift about 500 – 800 lbs if memory serves me correctly as a man, but lift 11 tons in costume while spidey could lift only 10. I guess they’re going with a revisionist take on the character (if it turns out to be true, which I’m still not convinced). I kind of like it. I’d just like to say that that “Bilbo transfixed” scene that lasted only half a second, freaked the crap out of me when I first saw it. Seriously…he got all evil and nasty in zero to sixty. The the casting recommendation you made. Can you please say the name of character they want to cast? If not please give some hints? Is it a mutant or a human? Good guy or villain? Had a co-worker come back from an earlier screening of it and I have to agree with Poland from what the guy told me. That combined with the ads for the film basically portraying it as: “Come see people get tortured!” I get this sinking feeling inside about the kind of people who may “get off” on that sort of stuff. Considering the film is getting a wide release instead of something DTV (a sort of ficitionalized Faces of Death maybe?) just makes me shake my head that this stuff is getting mainstream cred now. I’m not a Christian who shuns horror as horror done with morality and thought can be entertaining and edifying but this kind of movie really is for the lost. Not sure why I feel strongly enough about the film having not seen it (not to mention I find films like Audition and Battle Royale good) but from everything I gathered about it, it just rubs me the wrong way. And it’s been far too long since I saw a good Rory Cochrane performance (I guess he’s been off doing TV).